This week for Anime Sunday I’m covering another series from this winter’s line up. 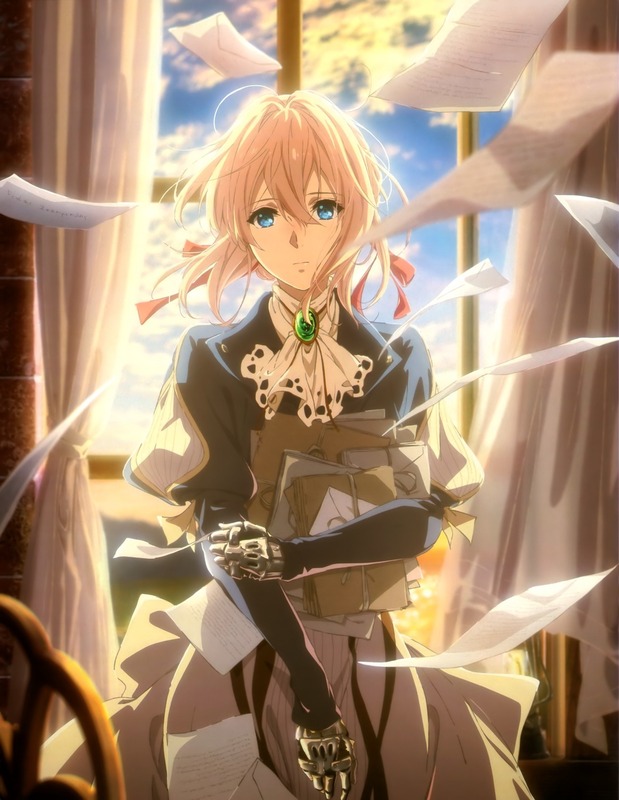 It’s my Violet Evergarden Episode 01 Impressions! Plot Synopsis: Violet is a soldier in the Leidenschaftlich Army who served under Major Gilbert Bougainvillea, who she was utterly devoted to. However, Violet is injured after a mission which resulted in the loss of her arms, requiring them to be replaced with prosthesis. Colonel Hodgins, an old acquaintance of Gilbert, arrives to pick up Violet. He explains to Violet that the war they were fighting has ended and peace has come, though he is unwilling to tell Violet what happened to Gilbert…. Plot: This isn’t a happy series, despite that I’m still deeply interested in watching this series despite how depressing the setting seems to be. I will note that this an adaptation of a completed Light Novel series, so the adaptation should cover the entire story, although I don’t know anything about it myself. I enjoyed this first episode, and I’m curious to see what occurs in later episodes. Characters: Violet is a very broken young woman, and yet I still found her endearing, if a bit distant. The rest of the cast is good too, although we don’t have much of their background story yet. Hell we don’t even have much of anyone’s background. Hopefully this is fleshed out sufficiently in subsequent episodes. Art: This is a Kyoto Animation production, so the quality is quite good. That being said I still find it lacks the fluidity of ufotable’s work, but I wouldn’t use that particular animation studio as my gold standard if it wasn’t as good as it is. Music: The score is very fitting, with little to no uplifting tones used in this first episode, it fits the somber mood of the episode incredibly well. Overall: Definitely worth a watch, although I expect this series to be a real tearjerker given the mood of this first episode. For those who like: Drama, Military Fiction, Broken Main Characters, Excellent Artwork, Fantastic Score. Hey all, this week for Manga Monday I have another Quick Review. 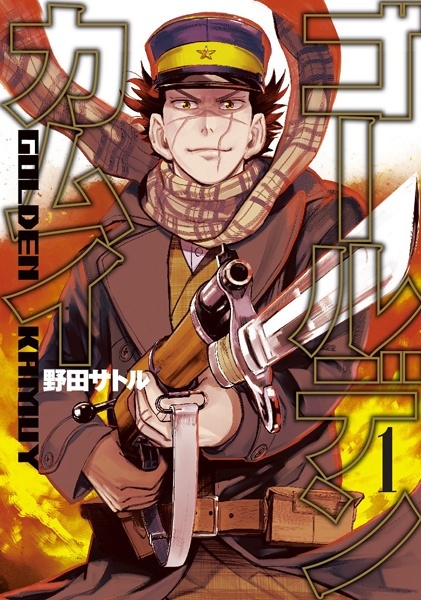 It’s Golden Kamui by Noda Satoru! Plot Synopsis: In Hokkaido, the far northern lands of Japan, Sugimoto survived the Russo-Japanese war of the Meiji era. Nicknamed “Sugimoto the Immortal” during the war, he now seeks the riches promised by the gold rush in hopes of saving the widowed wife of his now deceased comrade from the war. Plot: The plot is pretty awesome, I was pretty much instantly hooked after this first chapter, hopefully I’ll get to read all of it sooner rather then later. I do want to point out one more thing about the series, it is award winning, so take that how you will. Characters: Sugimoto is a pretty interesting guy, it’s pretty obvious he’s dealing with serious issues from the war he fought in, despite all that he’s a pretty stable fellow. The rest of the cast we’ve met are pretty much nameless, but they look fairly interesting from this first chapter. Art: The art is amazing, but once I looked up who the publisher was I wasn’t surprised to find it was Shueisha. That being said it is very graphic, so those with squeamish stomachs should probably not read this. Overall: This has me hooked, so I’m going to give it the go ahead. Plus it’s an Award Winning series, it can’t be super terrible if it’s received an award. For those who like: Historical Fiction, Military, Drama, Action, Adventure, Romance, Excellent Plot, Amazing Cast of Characters, Fantastic Artwork. This week for Anime Sunday I’m covering one last series from the Winter 2017 Season. 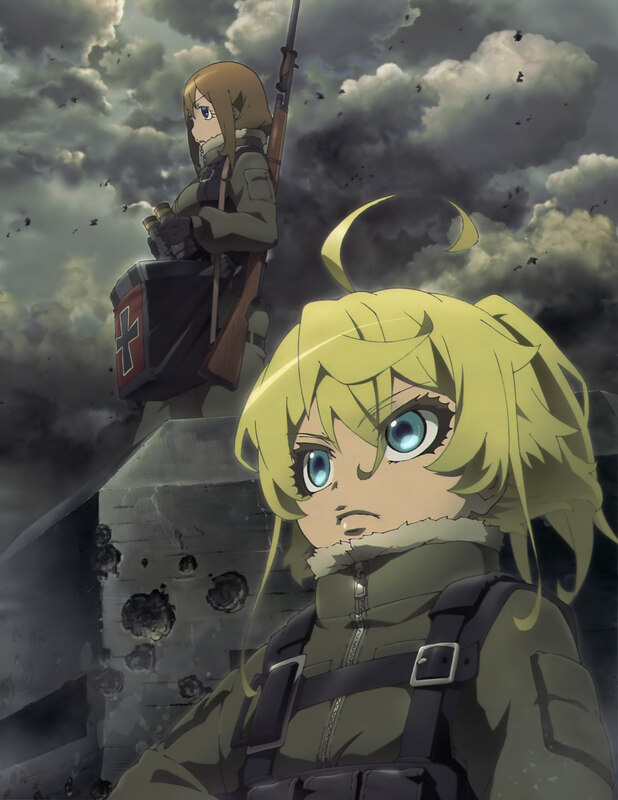 It’s my Youjo Senki Episode 01 Impressions! Plot: The plot of this first episode is really intense, it’s pretty much nonstop action the entire time, and while there are some more low key sections in the episode they are only low key in the term that there isn’t any physical combat occurring. I really enjoyed this first episode and while I have yet to watch the entire season’s worth of episodes it will be watched in the next few days. However based on this first episode I’ll be incredibly surprised if I don’t love the hell out of it. Characters: Tanya Degurechaff is our heroine, and she’s a feisty little girl who somehow ended up on the front lines in the Rhine theater. She’s not the typical heroine, and that’s all I’ll say about her. The rest of the cast is interesting as well, although Vicky is probably going to end up being my favorite side character. Art: The art is excellent, by a studio I’ve never heard of NUT before. It was quite well done. I hope the quality sticks throughout the entire run of episodes. Music: The music was equally as good, although we really didn’t get to hear the opening and ending themes I’m going to guess they are just as good. Overall: This is definitely a must watch for any Anime fan. Although the subject matter is probably not appropriate for children so don’t watch with them. For those who like: Fantasy, Military, War Fiction, Excellent Plot, Fantastic Cast of Characters, Amazing Artwork, Great Musical Score. Not for those who don’t like: Any of the above, but really you ought to give this a chance. This week for Sensate Saturday I’ve got another Quick Review. It’s Husk of Eden by Kisaragi Yoshinori! Plot Synopsis: Eripha is the only girl in the garrison of the World Government’s army that is protecting the city of Eldorado from terrorists. After being stationed there for three months she finally warms up to a boy in the same troop, Melka Dracea. But a sudden raid from the terrorists changes their situation, drastically. Plot: This is a really messed up series, it’s not a happy one at all. 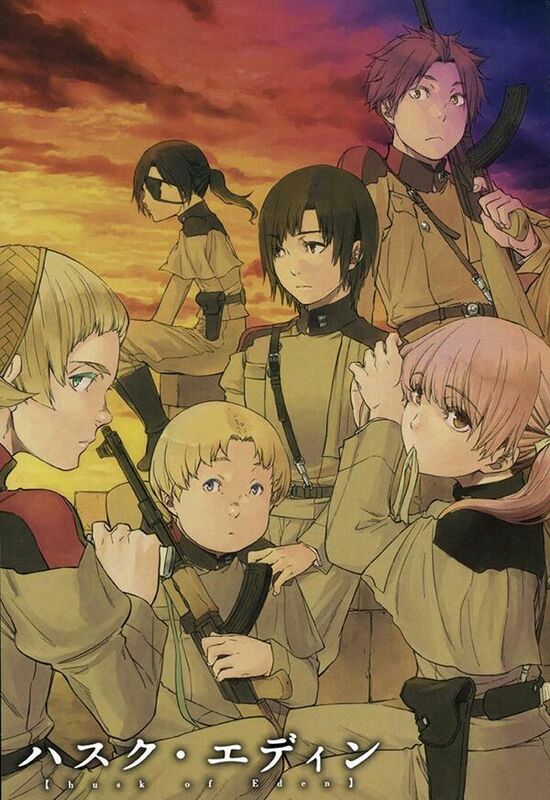 It’s full of child soldiers, in fact that’s the main premise of the entire series. Frankly I probably won’t read the rest of the series for a long time, most likely until I get my depression under better control because of how depressing this series is. I won’t go into details, as it’ll be super spoilerific, but if you have depression this may be a series you want to skip. Characters: Eripha is a pretty quiet girl, and I enjoy that about her character quite a bit. Melka on the other hand is a brash, outspoken boy. Between the two of them I prefer Eripha, but Melka isn’t a terrible character either. Their leader on the other hand is pretty mysterious, and I have the feeling there’s more to him than we get to see in this first chapter. Art: Pretty good, it’s fairly detailed for the most part, but it definitely isn’t Shueisha level in terms of quality. Overall: If you can deal with depressing stories, this might be a great read for you, especially considering that the series is complete at four volumes. If you can’t however, this is a series better skipped than read. 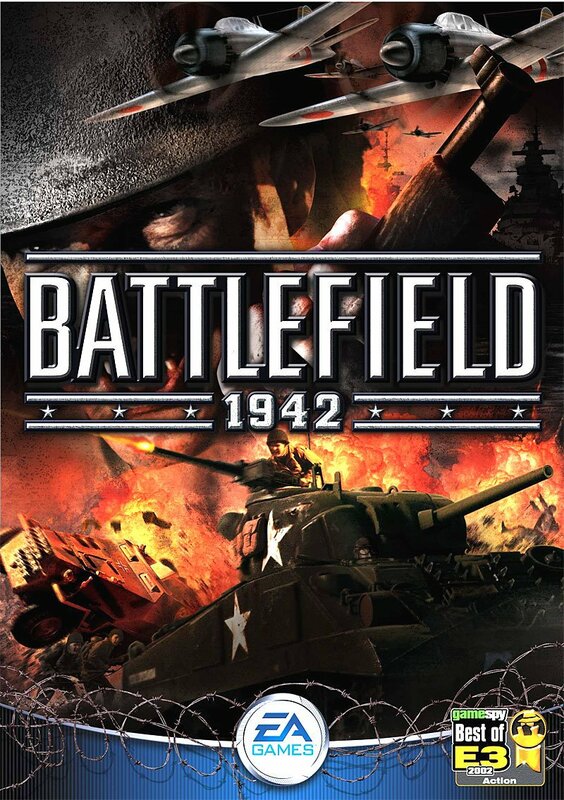 For those who like: Drama, Slice of Life, Action, Military, Tragedy, Good Lead Character, Decent Artwork. This week for Manga Monday I’ve got another Quick Review! It’s Shoukoku no Altair by Kato Kotono! Plot: This first chapter is pretty awesome, and had me hooked from the first few pages. I’m really looking forward to reading the rest of the series when I get the chance. Hopefully that will be soon, as this series really looks to be awesome. 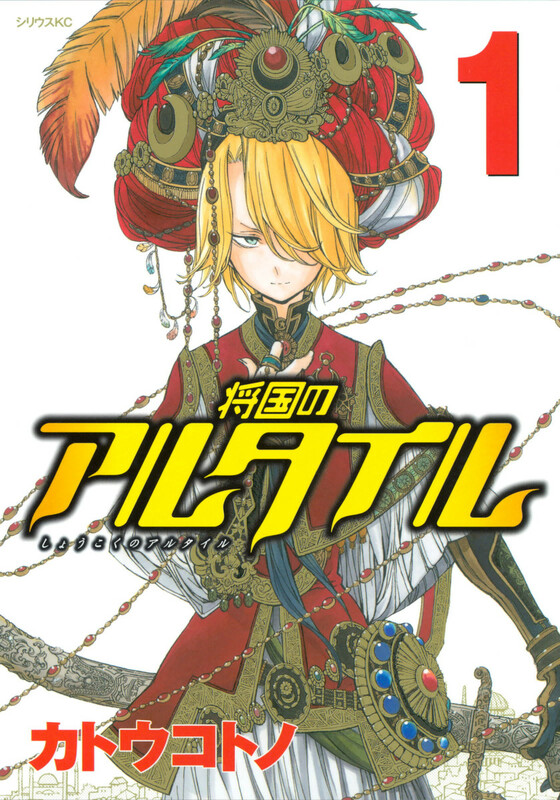 Characters: Mahmut is a pretty awesome male lead, and his pet eagle Iskander is just as awesome. The rest of the cast is great as well, and I’m excited to start meeting new characters. Art: The art is excellent, in fact if I didn’t know from looking up the publisher, I’d have guessed that this was run in a Shueisha publication given how good the art is. 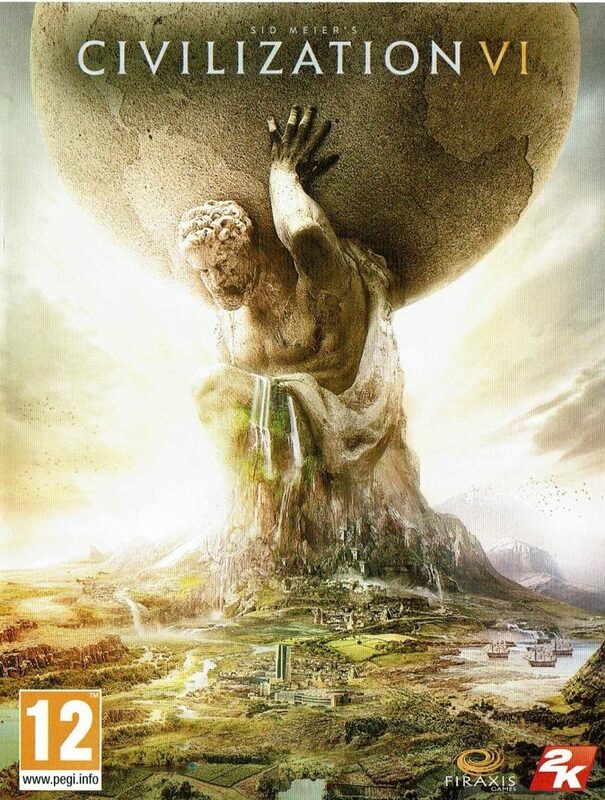 Overall: Giving this the definite go ahead, Altair should prove to be an awesome series. For those who like: Action, Drama, Historical Fiction, Military Fiction, Awesome Male Lead, Fantastic Plot, Great Artwork, Excellent Cast of Characters.